1.6 H E L P! ! H EL P! ! HELP!! HE L P! ! HELP!! Tue, Nov. 4th: Election party at Bob & Betty Hurt's, 1456 Fillmore, 7:30PM. 4th Wed. of month: Board of Directors meeting at CLP office, 7:30PM. Dwight Filley is having a letter writing get together on the 4th Tues, July the 25th. Call at 322-2689 for details. This will be somewhat of a party-brainstorming session - BYOB & food. The Advocates for Self-Government will present an exciting informative and entertaining program about America. The event takes place October 15th at 7:00 P.M. in the University of Denver general classroom building, Room 451, which is located at 2040 So. Race St. For information contact Carolyn Phelps, 688-6831. While this talk will be aimed at non-libertarians, you folks might get some good ideas too. The seminar is intended to show folks how to get government out of their lives, not to spread libertarian philosophy per se. It is to contain practical ideas for becoming a self-governing person. You are encouraged to bring a non-libertarian friend for an excellent exposure to libertarian ideas. Even (Jr.) High school students have found him very informative and interesting. 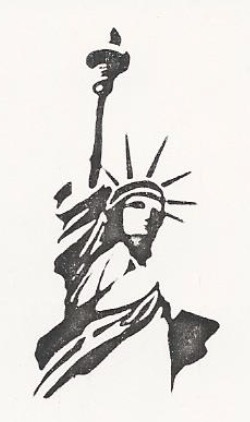 The ASSOCIATION FOR SELF GOVERNMENT is a non-partisan educational organization specializing in rediscovering ways in which liberty minded persons can become more free, and communicating these ideas to others. Marshall Fritz shall speak, and is, by the way, an excellent speaker. For some interesting radio talk turn to KLTT radio 8:00 AM for the Larry Lopez Alexander Show, Mon. thru Fri. 6:00 to 8:00 P.M. Though this is a Christian radio show, it tends to a libertarian constitutional orientation. Every Tuesday at 8:00 p.m. there is a seminar on constitutional law given by John Pleasant at his residence. Call 761-4565. Really folks, if you do have a job, can't you afford 10 cents a DAY to help the cause of freedom? I mean that's less then a piece of penny candy costs. I mean, if all of you who get this and are employed only purchased 10 cents worth of freedom each day, then we would be in good shape. Please start a twinkee Jar. What is a twinkee Jar?? We1111. . .
Our fore-fathers, and mothers, pledged their lives, their fortunes and their sacred honor to give us the freedoms we take for granted. Can you Pledge 1/2 of your weekly (pick one -twinkee, chocolate, beer, cigarettes) ration to help maintain those freedoms? A good way to do this is to have a Jar, and evet·ytime you purchase one of the pledged items, put a matching amount in the Jar. H E L P! ! H EL P! ! HELP!! HE L P! ! HELP!! Can anybody help with clerical stuff? Penn needs a person to volunteer one morning a month. We can help someone. If you would like to use an office in exchange for answering the phone and a nominal monthly fee, contact Dave Daniels about sharing the Party office, and having it mostly to yourself in the day. Mary Margaret, a Libertarian in Ft. Collins, and a mover and shaker in the same city is having a presentation by Marshall Fritz her home. This is at 1317 Lakewood driver, Ft. Collins. Phone is 484-8184. The Pot luck is at 6:00 P. M. and program is at 7:00 P.M. Just show up and bring some non-libertarian friends. Volunteers needed on any and all weekends to go canvassing with Dave. Saturday, Oct. 18th from 10 to 12 at Dora More School will bE a candidate forum. You are invited to lend moral support and ask questions. Dr. Robert Genetski is the chief economist with the Harris Bank in Chicago. At a recent speech at a symposium of key Colorado legislators and business leaders he stated that both his own investigations and a study by the University of Alabama, funded by Sears Roebuck, indicate that economic growth and climbing taxes are fundamentally incompatable. He challenged the folk beliefs of Colo lawmakers that higher public spending helps the economy, and indicated that there is decisive evidence from follow-up studies of Prop. 13 in calif. and Prop. 2.5 in Massachusetts, that tax reductions were catalysts for economic rebounds in those states. He said "I urge you to resists any further increases in Colorado's tax burden because you will do serious harm to the state economy." He insisted that the projected state windfall of $200,000,000. from the fed. tax reform be given back to the citizenry. When asked about "4" he was" all for it"
So lets make Colorado a Tax limitation state. Volunteers are needed to pass out literature, man phone banks, lick envelopes solicite funds etc. Call the Amendment 4 campaign hdqtrs, 744-7584 744-7585. Ask for Ruth Prendergast. Address is 695 South Colo Blvd. PLEASE!! HELP PUT ACAP ON TAXES!! An affilliate in Colorado Springs is being formed Thurs Oct. 23. For details call Rob Herzfield's home 633-2433. You can register thru the mail as a Libertarian. Call County Clerk and recorder & elections office. Call Kate to help With Colo. Liberty.